Working closely with the author of the highly acclaimed Sir Edmund Hillary: An Extraordinary Life, writer David Larsen has produced a readable, exciting book aimed at young readers in the 9-14 age range. Reaching the Summit follows in the tradition of successful recent books about Burt Munro and Sir Peter Blake, transforming bestselling adult books into accessible texts for younger readers. In Reaching the Summit the emphasis is at all times on high adventure. The book tells the story of the young Ed Hillary growing up in the Waikato, his increasing love of climbing and the outdoors, his early climbs and growing reputation, then the Everest expedition and the ascent on Mt Everest itself. 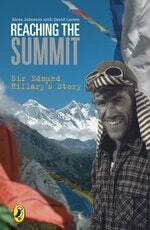 It describes in gripping fashion the successful assault on the summit by Hillary and Tensing Norgay, and the aftermath. Reaching the Summit then goes with Hillary to Antarctica and the trek to the South Pole, then summarises the rest of his life. Love Reaching the Summit: Sir Edmund Hillary's Story? Subscribe to Read More to find out about similar books.